Optimum wheel cleaners are effective, appropriate for all types of wheels and rims, are water soluble and are non-abrasive. Ideally, this optimum product has a competent spray on/hose off approach and is minimally intrusive in terms of offensive odor, damage to skin, and potential damage to the environment. We have found the best aluminum wheel cleaners available in different price ranges. Surely one will be a match for your needs and budget. The current fashion in wheels tends toward an open rather than closed rim design. This exposes the wheel rims to brake dust, which is a more significant factor in rim maintenance than might initially appear. Brake dust includes metal fibers from the brake pads that can scratch the rims if not removed with care. Our Gold Wheel Cleaner is CarGuys Premium Wheel Cleaner. This Cadillac of wheel cleaners is safe for all wheel types so you don’t have to read the fine print to see if your wheels are safe with CarGuys. By way of example, the CarGuys state that their cleaner is safe for alloy, aluminum, anodized, chrome, painted, polished, clear-coated and plasti-dipped rims. This cleaner is also applicable to motorcycles, which have their own set of requirements and even white walls. It cleans your wheels of brake dust, grease, salt, mud…you name it. It washes wheels and rims equally well and cleans both to an attractive shine. This should be the spray on/hose off product you have been looking for. However, though this cleaner does remove a fair amount of built-up grime with the spray on/hose off process, to achieve pristine, shiny wheels, most users report that you have to add some elbow grease. Most users suggest that moderate brushing with an appropriate wheel brush after you apply the product but before you rinse is sufficient. Please use an appropriate brush for this purpose. Wheels are more delicate than they appear and require soft brushes or cloths for cleaning. Indeed, though the Holy Grail of wheel cleaning is spray on/hose off, it seems to be still hidden in the mists. Currently, the best products on the market require a combination of scrubbing and chemicals to accomplish their assigned task. The variable is how much scrubbing; CarGuys Premium only requires a little physical effort. Though the delivery method is a standard spray bottle, this product is a gel. This enables it to cling to the wheel for the waiting period before rinse-off, which is an admirable feature. The cleaner has no offensive smell; no reviewers reported that it makes your eyes water or burns your throat. You can safely use this product without gloves. The only cautions associated with this cleaner are that you ensure that your tires are not hot when you apply the product and that you do not leave the spray on your wheels for longer than two hours. Since most users report excellent results in five minutes, it seems you would leave it on for hours only by accident. Other important details of this cleaner include that is ph balanced and acid free, safe for the environment and made in the good, old USA. At $17.50 for 16.9 ounces, CarGuys Premium Wheel Cleaner costs close to a dollar an ounce, which is pricey. However, the manufacturer insists that you use only a small amount of the product for each wheel. CarGuys is a fairly new company and at the time of this review does not have the dedicated staff of the big players in the market. This is primarily visible in the area of customer service. Their only form of customer service is by using the email form posted on the website. For the purpose of this review, this process was tested for turn-around time, which was very good. The CarGuys expect to have more administrative functions established soon, but for now the email process is an excellent one. CarGuys fully supports this product. They offer a 100% money back guarantee. All uses who reported any interaction with the company review that experience positively. In many cases, CarGuys placed follow-up calls to purchasers to receive their feedback. Our silver winner is Sonax Wheel Cleaner Full Effect made in Germany. This is also advertised as a spray on/rinse off cleaner and as with CarGuys, most users found that they needed to scrub a bit for good results. Ph balanced and acid-free, this cleaner is advertised as appropriate for all wheels, including aluminum and alloys, painted, anodized, clear coated and motorcycle. Sonax has a trick effect that is much appreciated by most users. When you spray the product on your wheels, it is a neon green color; as it makes contact with the iron fibers deposited by your breaks, it turns red; this is designed to indicate that it is working to dissolve the iron. Though Sonax is not a gel, the consistency is heavier than water enabling the cleaner to hold onto the wheels to complete its task. The instructions indicate that you should spray on cool, dry wheels, leave to work for about five minutes but no longer than ten. There is no indication of what leaving Sonax on your wheels longer than ten minutes will do, but one has to assume the results would not be desirable. At $15.00 for 16.9 ounces, it is less expensive than CarGuys Premium, but not significantly. The odor of this product is very strong and unattractive. 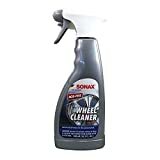 Similar to sulfur on steroids, more than a few Sonax reviews were put off both by the odor and that the odor is lasting long after you have finished washing your wheels. Several reviews mentioned that the odor was noticeable two days after use. Sonax, though ph balanced and acid-free, is not safe if the spray lands in your eyes or on your skin. Follow the described emergency procedures for these circumstances. Additionally, some reviewers found that the solution burned their throats and eyes without contact. Clearly, you must use this product with caution. Though they do not offer a guarantee, the Customer Service representative was kind enough to say that Sonax does stand behind its product. If you feel the product did not perform as described, contact them to present your case and apply for reimbursement. They evaluate each petition as presented. Our bronze winner is Mothers Polished Aluminum Wheel Cleaner. At the bronze level, we begin to see significant savings per ounce. 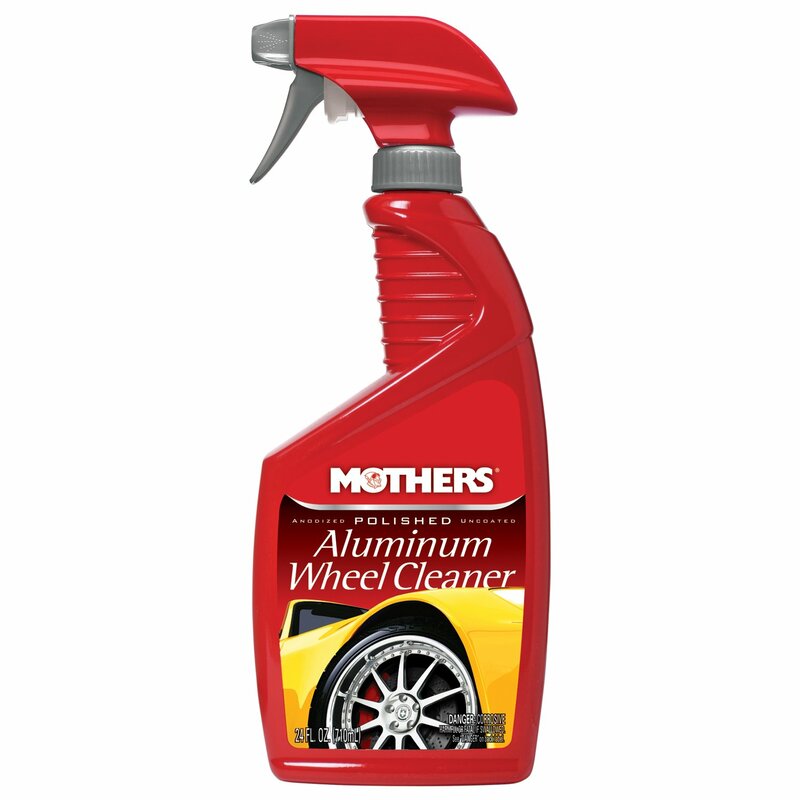 You can purchase 24 ounces of Mothers Polished Aluminum Wheel Cleaner for $9.45. Another distinction is that Mothers is generally available in larger containers or in multi-packs which further reduces the price. Mothers products are attractively packaged in bright red containers for easy identification. Products that have larger covers also bear the distinctive Mothers logo of a senior woman polishing a car. The Wheel Cleaner is packaged in a spray bottle and Mothers offers refill bottles so you are not constantly paying for another appropriate spray bottle. Mothers is also advertised as spray on/hose off. Many reviewers supported this process saying that they did not need to do more than light agitation for excellent results. Others reviewers insisted that they saw no improvement at all after using Mothers with or without scrubbing. The bulk of reviewer opinion is positive. Mothers does what it claims to do. One factor that adds to the complexity of these evaluations the nature of the personal review process. Since reviewers seldom include before and after pictures, all that is left is their perception of how well the product works. There is no real way to know if the wheels were comparatively dirty or if the reviews with poorer experience actually had dirtier wheels. More than one reviewer recommended against using this product on painted wheels. Mothers is designed to work on uncoated polished aluminum and anodized wheels. 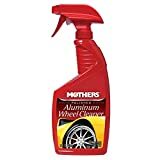 Mothers Polished Aluminum Wheel Cleaner is the product of the Mothers Polish Company of Huntington Beach, California. Like Sonax, and unlike CarGuys, it is a long-established company with an extensive line of car care products. A Mothers spokesman explains that the name was selected by the founders to give the impression of consummate trust. Though not stated with the cleaner, Mothers stands behind its products. If you are dissatisfied, contact the company to find out how to obtain a Return Mailing Address label to return, request and exchange or refund. To accomplish this, include your name, telephone number, mailing address and email address. For product refund or exchange, Mother’s also requires the details of the car on which you used the product, such as the make and model as well as the 5-digit product number from the UPC. Include a detailed explanation of how you used the product, your results, and how the cleaner fell short of your expectations. Mothers is another cleaner that you will not confuse with a perfume, though none of our reviewers reported any negative effects of working with the product. None registered reports of eye, nose or throat irritation. Additionally, as unattractive as the product smells, it does not have the staying power of Sonax, so you can expect it to dissipate soon after you use it. You can still have lovely wheels and rims even on a shoestring budget. Meguiar’s Hot Rims is our cheap winner. For an investment of about $6. 00 ($5.87) you can purchase 24 ounces of wheel cleaning power. 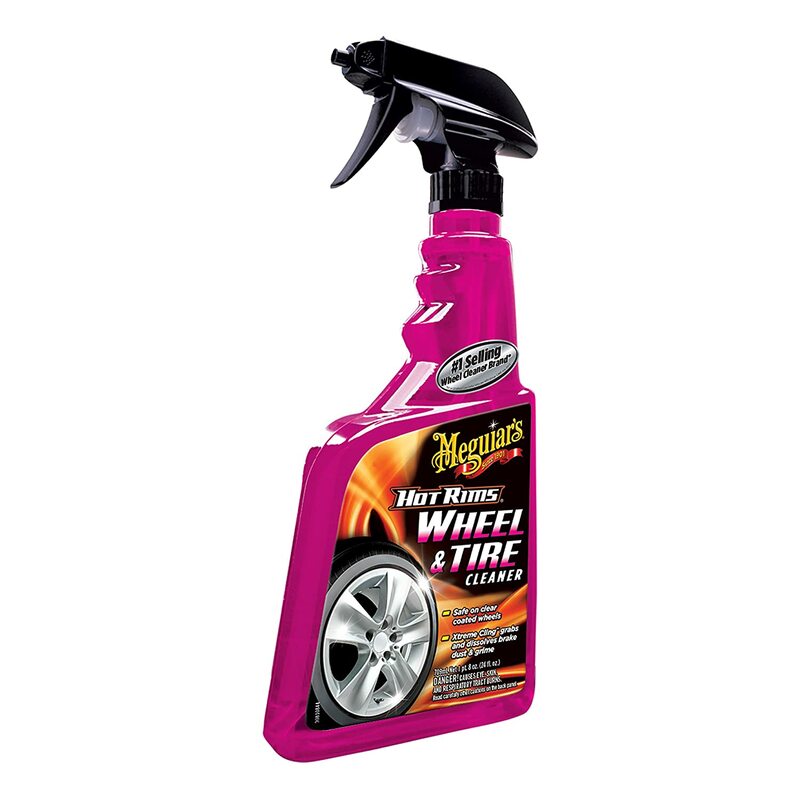 Packaged in a hot pink spray bottle, Hot Rims promises that it is safe on all clear coated wheels. Meguiar’s customized Xtreme Cling formula is designed to hold onto your wheels and rims so the chemical power sticks where it is most needed. This feature renders unnecessary many repeated sprayings, required by similar products. Meguiar’s takes a different approach to wheel and rim cleaning. They offer three specialized wheel cleaners: Meguiar’s Hot Rims Aluminum Wheel Cleaner, Meguiar’s Hot Rims All Wheel and Tire Cleaner, and Meguiar’s Hot Rims Chrome Wheel Cleaner. 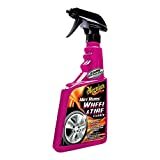 Meguiar’s Hot Rims Aluminum Wheel Cleaner. Meguiar’s Hot Rims Aluminum Wheel Cleaner is the safest of the three. It is safe for uncoated or polished aluminum, anodized and powder coated wheels and Meguiar’s recommends using this product if you are unsure of the finish of your wheels. Meguiar’s is counter recommended for motorcycle wheels or aftermarket, painted or colored brake components. Hot Rims recommends a very slightly different application process. As usual, ensure that your wheels are cool. Rinse them with cold water before applying Hot Rims. Apply to one wheel at a time. Thoroughly coat the wheel; wait 15 seconds; rinse off. Do not allow the product to dry on the wheels and do not allow it to remain on the wheels longer than recommended. Very dirty wheels may require repeat applications. There is no published explanation for the much shorter application set time for Hot Rims. However, reviewers who ignored that time parameter were not happy with the results. It is best to follow the directions exactly. As with our other winners, you do need to scrub the wheels after you apply the product. Do remember that, though intended for many miles of long, hard service, your wheels and rims are delicate. Use an appropriate washing tool only. Clearly the grandfather of pre-purchase considerations is effectiveness. This is not listed as the primary consideration because it is assumed. Certainly products have different levels of effectiveness and reviewers with different cars, environments, or goals can judge the offerings from their unique perspective. However, we still operate under the premise that all of the products that offer themselves as wheel cleaners are capable of doing so. With that determination in place, we move the next important pre-purchase consideration which is ease of use. We can all have beautiful, clean wheels if we are willing to work for them. Take the wheels off your vehicle. Use a degreaser and soft cloth to clean off surface grease and break dust. Rinse with pressure washer or hose. Repeat until clean. Apply polish. By hand or machine, work polish into metal surface. Buff to mirror shine. The above described process is too much work. If you’re are going to purchase a product to clean wheels, you want something easy to use. Ideally, you want a spray on/hose off cleaner. You don’t want to have to remember whether or not your wheels are coated or what they’re made of. Considering that amount of abuse and exposure to all manner of sticky, abrasive, oily, dirty and offensive material to which we expose our wheels, it’s a wonder anything can actually clean them. But those of us particular about our cars want clean wheels as well as clean everything else. If you have to use a full bottle of the cleaner for each wheel, any advances associated it pale. The product you select should be both easy to use and consume an acceptable amount of product during each use. This allows for times when the wheels are extra dirty from a winter storm or due to mud season and everyone expects to invest a little more product for optimum results. This includes how, if at all, the product affects the natural environment, as the term is commonly applied today. However, this also includes your personal environment. Dose the product have a very strong odor? Does it sting your eyes when you use it? Do you need to wear gloves when cleaning? Is the clean-up process complicated? Does it require specialized tools or equipment to achieve maximum results? Our reviewers agree that these products are best used in the shade. All of our recommended sprays require that the wheels be cool before you apply the chemical. This is to avoid heat interaction with the sprays. Our reviewers state that heat interaction and drying of the product on the wheels happens when you work on your wheels in very hot conditions or in direct sunlight. Since both heat and product drying are counter recommended, adhering to the experience of our reviewers is recommended. Any good product is supported by its manufacturer. How that support evidences itself is an additional concern when purchasing. Do they offer a money-back guarantee? If so, how is that executed? If you have to ship back the unused portion of the cleaner, it’s too much effort. The manufacturer is not going to resell your leftover product, so a complex refund process indicates the possibility of under average support. What kind of support is available for the product? Is the only way to contact them an email form on the website? Do they have 24/7 telephone support? No visible customer support is clearly less interest than desirable. Though you may never need or want to return the product, customer support is still important as evidence of the genuineness of the offering. Our selections for wheel and rim cleaners offer our readers a variety of choices in financial and applicability. All of the products advertise spray on/hose off functionality, though our users universally agree that complete shine and pristine wheels usually require some elbow grease as well as product application. Additionally, our reviewers express caution when using any wheel and rim cleaner. They all contain chemicals that can damage finishes outside their listed conditions. All can give you the shine and cleanliness you desire when used appropriately. A note of caution: Many manufacturers offer high-end, very attractive wheel and rim finishes. If you use the wrong cleaning product on your wheels, you may damage them permanently. All of the products in our catalog state the appropriate conditions for their use. However, if you have any doubt, or even want reassurance before you begin cleaning, consult your manufacturer for confirmation. There are circumstances that void your warranty and using an inappropriate cleaning product is often one of them.